I started to get nervous standing near the edge of the cliff. I knew the device on my hand could teleport me anywhere in the visual field, and there seemed to be no reason it couldn't teleport me right over the edge. I'd already been dropping pineapples on a hotel terrace that afternoon, gazing at the Chicago skyline from a high balcony, and painting vividly colored messages in mid-air. But I didn't like the look of the cliff. Let me confess: This was my first full-on experience with VR — I'm not a gamer, not a sci-fi fan — and the experience was immersive, vertiginous, and strangely fascinating. From a marketing point of view, the use cases were obvious. What I'd been invited to experience was a series of virtual environments which could be used by a travel and hospitality brand for promotional purposes. You can see the appeal of putting prospective customers virtually on an exotic beach. It was just one of a range of innovative solutions I saw at Isobar's NowLab, housed some fifty floors above downtown Manhattan's Zuccotti Park, when I took a tour with Leigh Christie, manager of Isobar NowLab Americas. Isobar, which is part of the Dentsu Aegis network, is one of a number of agencies I've met recently which is pushing beyond the traditional boundaries of the business to offer a combination of digital marketing, consulting, and technology-driven services, aligning with client brands to redesign their customer experiences from the ground up. NowLab is Isobar's R&D core, developing innovative solutions, Christie says, in advance of specific asks from clients. "It's about staying on the cutting edge," he adds, explaining that it's a space for anyone and everyone in the office to try out ideas. It's not a white-coat only zone: "Not a research lab for a few people." The goal is: "Everyone's involved." Isobar has a global footprint, and a growing number of NowLab locations around the world, where employees can be found "tinkering, hacking, making, breaking," as Christie puts it. The advantage of opening the doors? "It's cross-disciplinary," he says. Having a wide range of people involved "helps remove technological blind-spots [and helps] everyone think innovatively." I saw 3D printing capabilities. I saw static wall displays transformed into AR fashion commercials for the wearer of Snap Spectacles (much more stylish than Google Glass). I saw the Device Lab, where a full range of mobile devices (including some real vintage ones — but no desktops) are ready-connected to test the rendering of digital campaigns. I was also the subject of a MindSight demo. The aim of MindSight is to detect the sentiment which lies beyond articulation. Confronted by "emotionally evocative" images, for example, some people choose not to express their genuine reactions, while others don't have the vocabulary. MindSight leverages an accepted finding of neuro-science, whereby just a second exists to detect raw sentiment before the subject starts to intellectually process it. In practice, this means going through a deck of images at high speed, recording reactions, essentially, before there's time to think. Isobar has had MindSight for around ten years, but it's more recently become "a standard part of the tool-kit for brand work." A large, qualitative study of response to imagery "takes almost no time." What's more, "you can aim the cannon anywhere," testing just about any kind of graphic brand concept. "Respondents tend to enjoy it, because they haven't seen anything like it before." 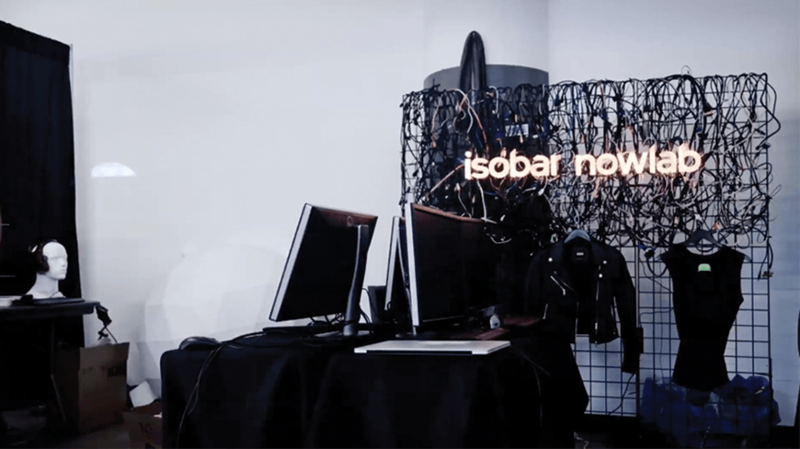 Speaking of seeing, here's a video about how Isobar NowLab is innovating. This article was originally published in DMN.